Many restaurants in this town have tried their hardest to put on the face of luxury; few have succeeded. Secluded in a quiet Thao Dien back street, Stellar (43 Tran Ngoc Dien, Thao Dien, D2) has done its best to attempt the opposite—set up a wordlessly beautiful venue where guests will feel both charmed and at home—and have surpassed themselves to the point that if this is casual dining, it’s the finest of its kind in the city. Stellar is jaw-droppingly impressive on two counts: firstly, the venue looks so much like a miniature five-star resort that I wasn’t the first person to ask if there’s an option to spend the night there. 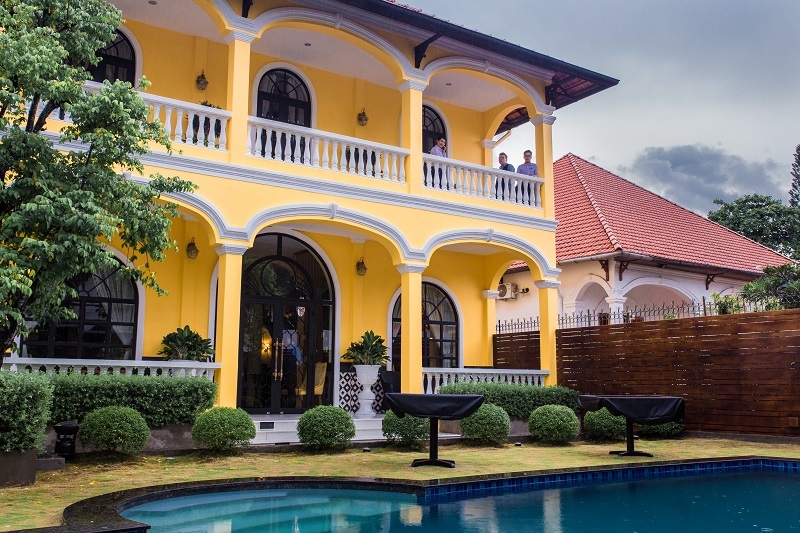 A perfectly-renovated villa, Stellar has no less than three water features installed outside, an immaculate bathroom, and a dream kitchen in a separate red-brick structure that is so spacious and squeaky-clean that most people would be quite at ease taking dinner in there. This last point relates directly to the second count: the quality of the cuisine. 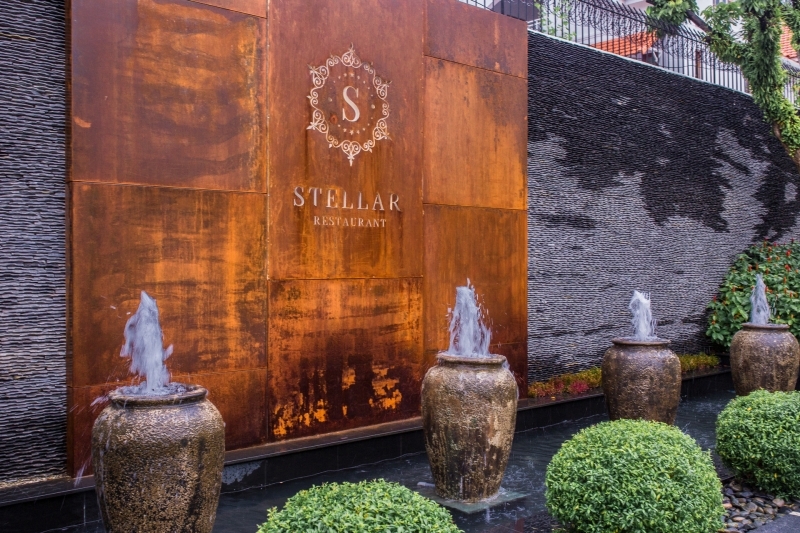 Stellar’s executive chef, Mr. Ittipol Samran, is a prestigious name in Thailand, where he has served royalty, ministerial diners, corporate demigods, and all manner of other VIPs. 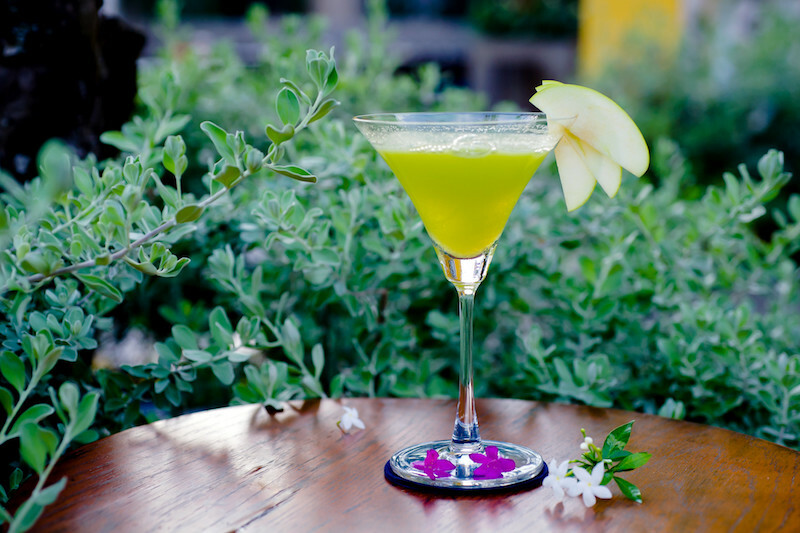 The restaurant’s Thai owners managed to secure this talent only by making this venue a chef ’s dream come true—the best kitchen, the best sous-chefs (a superstar mixologist specializing in craft cocktails is due to join the team this month), the best of everything. Chef Ittipol personally flew to Finland to touch the ebony-black stone serving trays before the order was approved; he hand-selected the German cutlery and opaque glass plates. His personal garden grows the best of his preferred herb varietals—one gets the sense that the cheffing job at Stellar was an impossible gig to refuse. Happy chef, happy diner. 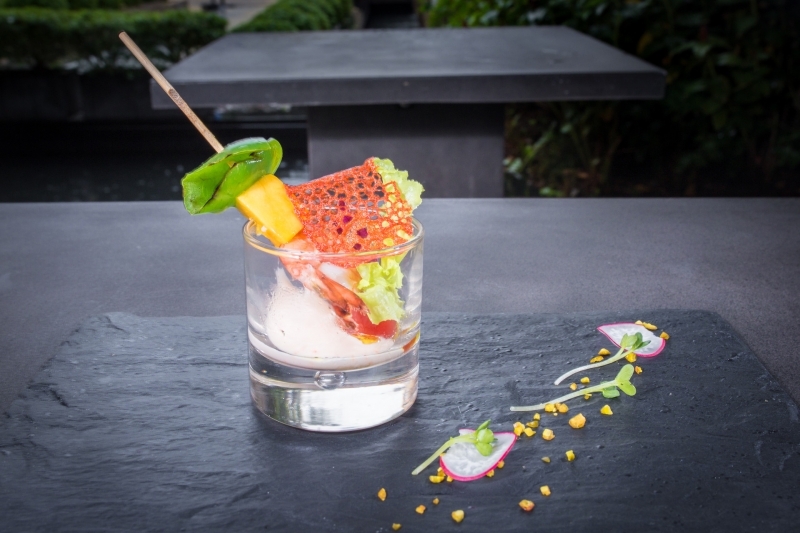 We reviewed a feast of Chef Ittipol’s choicest creations, starting with his amuse-bouche of the day—a banana prawn skewer with mayonnaise—with prawn, cherry tomato, mango, and capsicum served on caviar. The chef has a new (free of charge) surprise for diners every night; ours was fresh and filling and a succinct introduction to this chef ’s innate sense of playfulness with his own cuisine. We then embarked on a procession of absolute extravagances challenging the extremes of what could comfortably be described as “casual dining.” Opening with a mood-enhancing apple martini and fruity strawberry margarita (bothVND150,000) that awakened all senses to what was to come, we moved on to the pork kurobuta salad (VND250,000), which came prepared with some herbs, apple strudel, and cherry tomatoes with a little sautéed wild mushroom and Dijon mustard sauce. Even the appetizer had its own story—the pork is from a rare Spanish/Japanese hybrid animal with a super-soft pork neck that grills nice and juicy and carries a mild, gentle umami. Next came the foie gras peach pan- fried Toulouse duck liver, served with caramelized peach and peach sauce, alongside raspberries and rocket leaf. 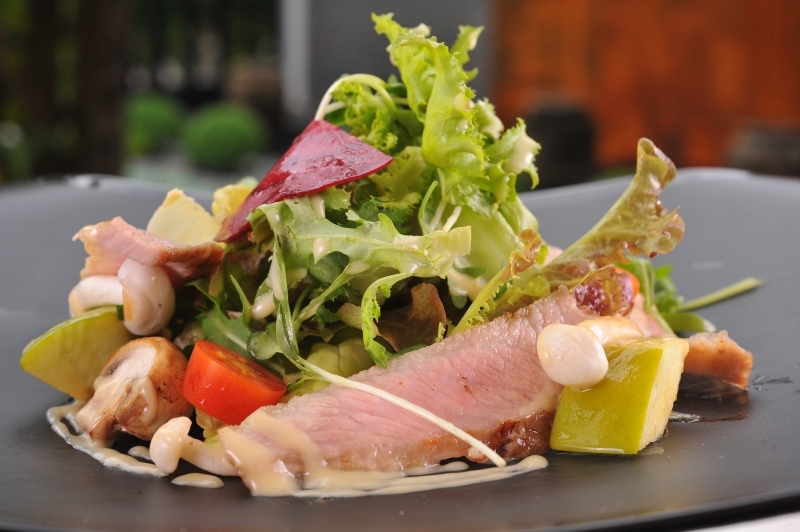 At VND490,000, this dish was firm and juicy rather than greasy, a difficult trick to pull off with foie gras. 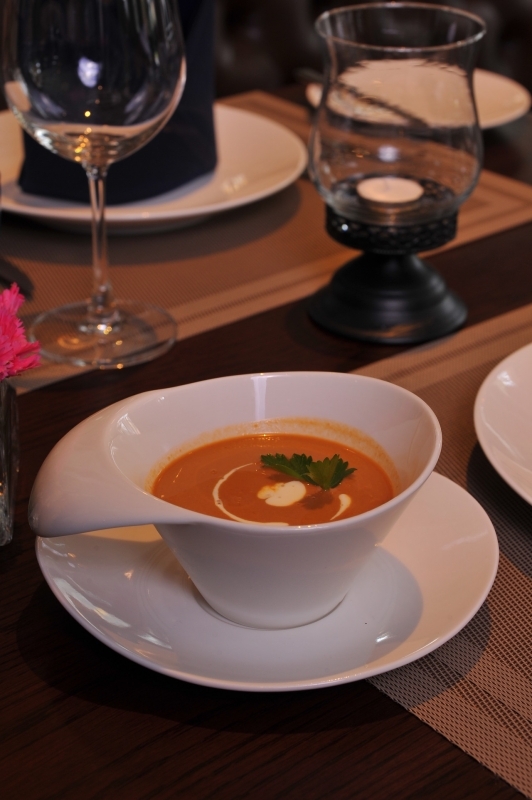 Likewise the complex flavors of the lobster bisque (VND225,000), a Canadian lobster broth flamed with cognac, comes masterfully prepared with light cream so as to avoid the heaviness sometimes associated with French soups that are rarely preferred by Asian expat clientele. 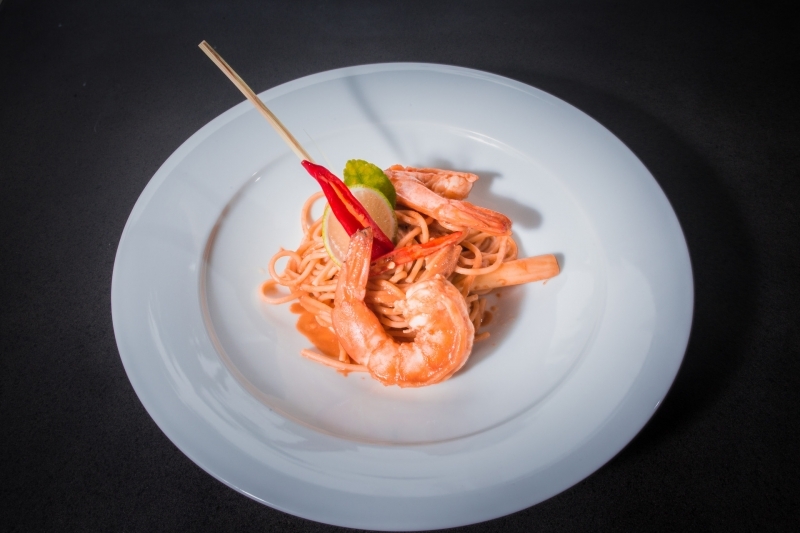 Stellar’s menu is largely focused around Continental cuisine (Chef Ittipol spent two decades in France), but there are some touches of Thailand, as revealed in the spaghetti tom yum tiger prawns (VND450,000), a sautéed pasta that draws on kaffir lime, Thai basil and galangal elements to refocus the pungency of the seafood into that characteristic Thai intensity much loved in the broadly-popular national soup dish tom yum goong. 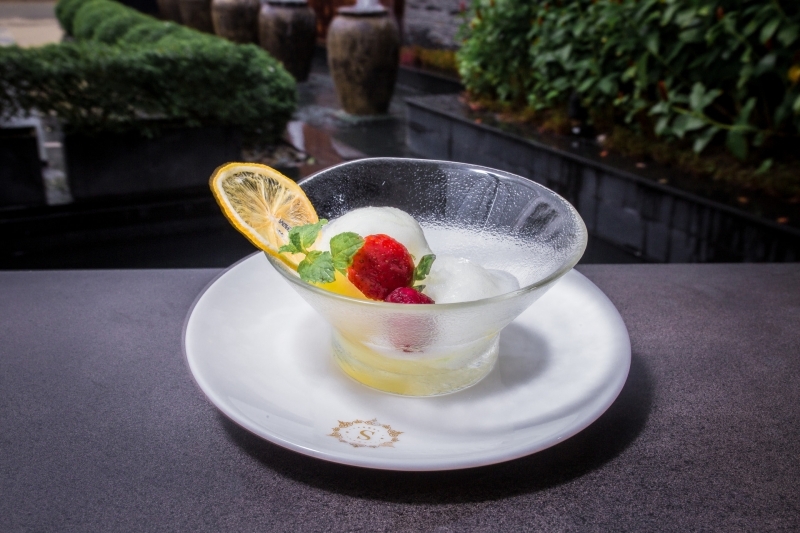 This was followed by a palate-cleansing lemon sorbet served with fresh berries (VND150,000) that was well-balanced and cleared the way for the meal’s second act. 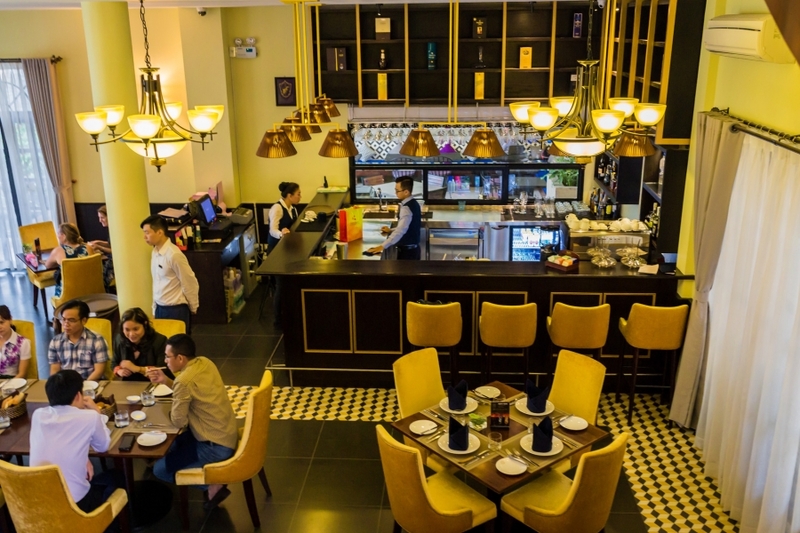 We enjoyed two top-shelf category dishes that dialed the decadence up to 11—starting with a pan-roasted snow fish steak (VND650,000) served with sautéed spinach, cherry tomatoes confit and balsamic sauce. 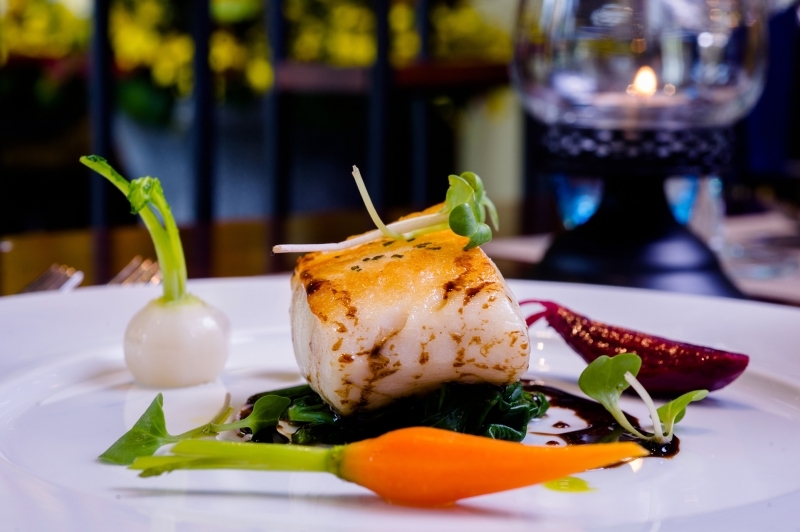 Snow fish usually makes for an oily steak; this serving is oven-cooked prior to roasting so as to deliver a melt-in-your-mouth consistency augmented by a heady port wine sauce and the texture of the side vegetables. 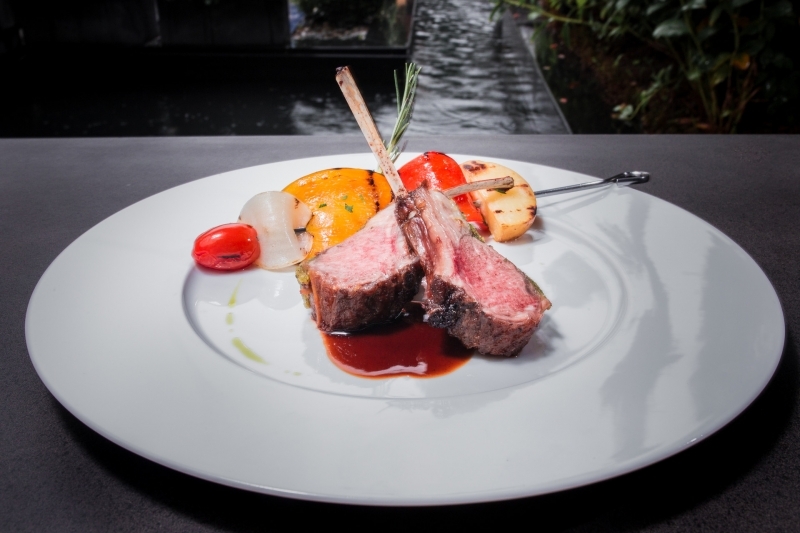 King of the night was the Australian lamb rack (VND520,000) roasted with crusted herbs and served with skewered vegetables and garlic rosemary sauce. While the quality of the meat was undeniable, the brilliance of the rosemary lay in its contrast with the mint sauces traditionally offered with lamb in many European countries—for those who grew up on it, this reboot on a childhood favorite is both surprising and familiar. It was nicely paired with a glass of boutique Chilean cabernet sauvignon. Stellar’s desserts are exceptional also—unable to settle for one, we shared a “Soft Bitter” chocolate cake with raspberry sauce filled with a French 60%-dark fondant chocolate, topped with vanilla ice cream and fresh berries, no less. At VND250,000, this dessert could easily have been sweetened to over-excess, but the sugar balance was very controlled. By contrast, the banana panna cotta (VND180,000) served with fresh berries, almond biscotti with vanilla sauce, stood out for its extremely intense yellow-banana taste, derived from its essence being handmade from the juice of crushed fresh banana, and including real Madagascan vanilla. 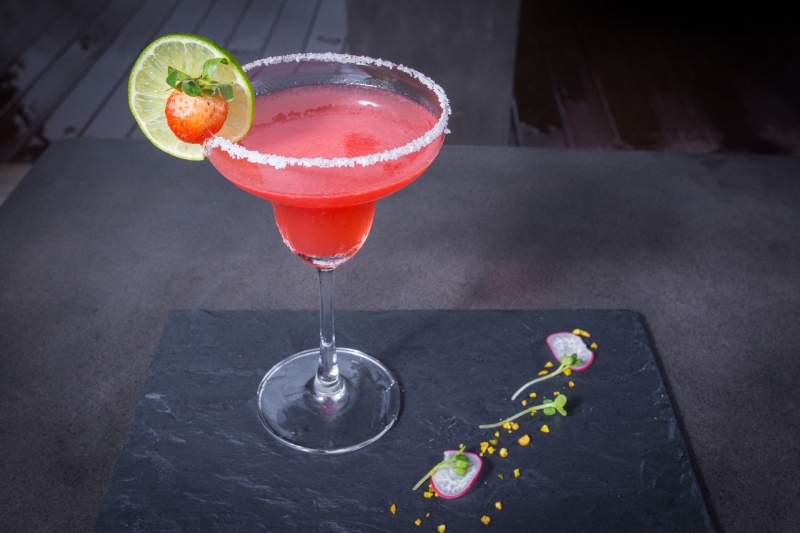 There’s no getting around the fact that Stellar is far more the fine dining venue than the relaxed restaurant it aspires to be, but that needn’t be any cause for concern. Come prepared for luxury treatment, but don’t dress up for it—have a good time at Stellar and for the course of the evening you’ll know what it is like to feel at home in a palace. Enjoy it.